A great coup for us last week. 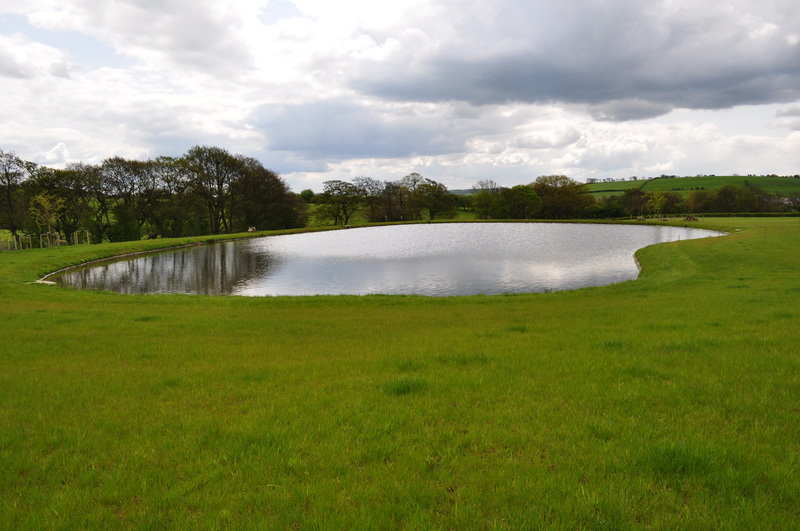 We were asked to come up with a native planting scheme and supply the plants for a large pond in Yorkshire for next spring’s Channel 4 series of The Landscape Man, presented by Matthew Wilson. Right up our street, but we only had 5 business days to do the whole thing… Undeterred, we parachuted pond consultant Hugh Roberts onto the site on Monday and had his planting scheme in our sticky hands that evening. Not only was he recommending a plant list, but there was also some bio-engineering to do to keep the pond bank from eroding. The owner had been persuaded to use granite sets to line a section of it, which would have to be removed and replaced with preplanted coir rolls. We had all the plants and rolls on site on Thursday to film the planting on Friday. Hugh was then on hand to help Matthew with the planting. Phew! Thanks everyone, especially Lew from Dragonfly Flora and Hugh. The site will not only be absolutely stunning but also a huge boon to wildlife – just the sort of landscaping we’re trying to promote. This cold dry weather is a nightmare, but I suppose at least it’s given me time to sit down and write a newsletter. I’ve been a very busy boy over the last month, so much to catch up on. We ran our first course in April, which seems to have been a great success. Tutored by Hugh Roberts of Environments for People we all learnt how to build a wildlife pond, now sitting in front of me. Thanks to Hugh and to our wetland plant supplier Gower Wildflowers. The pond’s already populated by a selection of interesting looking invertebrae, and the swallows are collecting mud from it as I write. All very rewarding. Next off are our meadow days, run by Sue Everett, on the 11th and 12th June. I flogged up to Sheffield last week to go to an intriguing workshop on Green Roofs and Living Walls, which is an area we’re keen to get more involved with. We already have a relationship with a consultant, and supply generic native seed and plug mixes for green roofs, but hope to do a lot more in future to encourage folk to plant native plants rather than just use the sedum mats they have done in the past. Green Roofs in particular seem to me to be a fantastic and practical way to encourage biodiversity in urban areas – among other advantages! I also hope we can do more work with seeds, where we are starting to supply end business customers directly. 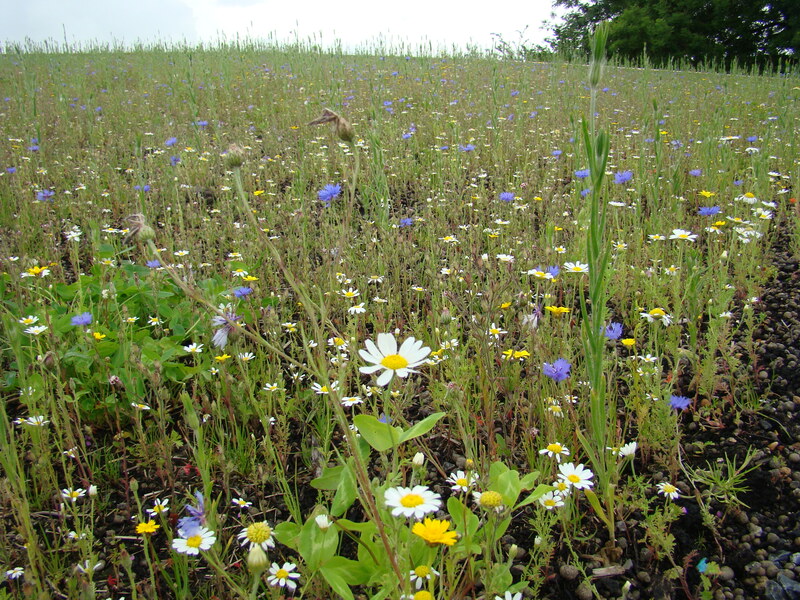 After a successful trial we are supplying the British Beekeepers’ Association (BBKA Enterprises Ltd.) with two native seed mixes particularly helpful for bees, which I have high hopes for. We’re also supplying Flowerworld with the seed for a 50,000 sachet promotion at Morrisons to promote the Bumblebee Conservation Trust. Our other bee related news is that we’re expanding our range of plants and exotic trees for bees as a result of some suggestions from Andy Willis at the BBKA Spring Convention and Norman Carreck at the Laboratory for Apiculture and Social Insects at the University of Sussex. They’ll be supplied by R.V.Roger and available from this autumn. We are seeing the first fruits of our work with designers, sourcing native plants for some very exciting schemes. We’re both promoting those currently working with habitat creation in mind, and encouraging others to think about it more. As to life here, Kingsley the new ram has been a success and the mad Runner Ducks are laying again, albeit mostly not in their Duck house. My bees are happy too, and I’ve set up a couple of bait hives for them. Mike the gardener’s grand veg plot looks great and our various mini-meadows look promising too – if only it would rain!